I’m sure it's happened to most of us. You're in the bathroom with your phone having a shower or a bath and your phone develops a sizeable amount of condensation on the screen. You may have even wondered whether it's okay to lay in the bath with the hot rising steam from the water with your phone, or even take the phone into the shower (trying to avoid as much splash as possible of course (or not!)!). So the question is; is it okay to use your phone in these moist, wet conditions? Straight off the bat, it's obvious to say that it all depends on the phone that you have. Some phones are specifically designed to be waterproof to a certain grade. For example, the Galaxy S4 Active (not to be confused with the standard Samsung Galaxy S4) is said to be waterproof to 1 metre (IP67), therefore can be completely submerged to this depth. In the case of this phone, taking it into the shower is not a problem and you can be confident it will still work when you get out. But we've all heard of or have had experiences ourselves of phones which have been dropped in water (i.e. the toilet), and have stopped working. Therefore there are phones on the market which are susceptible to water damage, so you'll want to avoid contact with water as much as you can as a precaution. I would think that phone manufacturers are required to waterproof phones to a certain level so that if one is out in heavy rain, holding the phone to your head that it would continue to work. This would be especially important in countries which have a lot of rain (i.e. England). If you do feel you have a phone which is hardy to a steamy or wet environment, you may well have experienced that it can be quite difficult to operate the screen of a smart phone when the screen is wet, or if your finger is wrinkled from being in the shower or bath too long, or if your fingers are wet. Find out what IP waterproofing grade your phone has. If the phone doesn't have the sufficient waterproofing for a steam shower environment, your best bet is to wait until you've finished your shower or steam session before you use your phone; but if you need to pop your head out to check an urgent message, have a towel handy just outside the shower next to your phone so you can dry your fingers before operating it! Below is the IP waterproofing guide. After the IP you'll find two numbers (i.e. IP67). The first number represents how dustproof the electrical appliance is, while the second number represents how waterproof the appliance is. 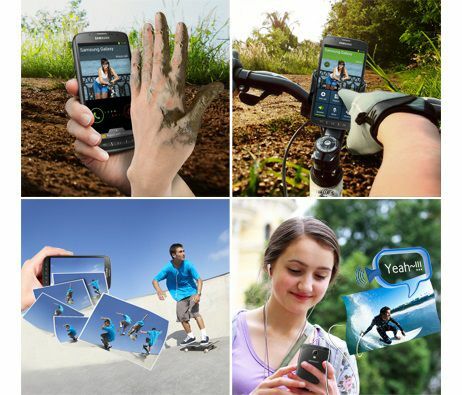 Therefore in the case of the Samsung Galaxy S4 Active phone, it would be 6 (i.e. totally protected against dust) and 7 (i.e. Protected against the effect of immersion between 15cm and 1m).